The Crew Yard at Village Farm Barns in Elsham, near Brigg, Lincolnshire sleeps 4 people. 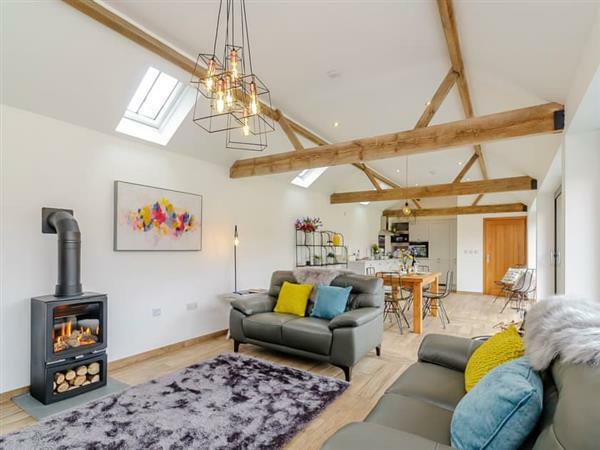 Village Farm Barns near Brigg is great for couples and families alike; these beautiful barn conversions (refs UK11123 and UK11124 [The Parlour]), once used as a WWII airbase, have been sympathetically and lovingly converted by the owners’. Situated in a lovely area close to picturesque market towns and rolling countryside, they are ideal for a relaxing break, family holiday or romantic getaway. Conveniently located for exploring North Lincolnshire and East Yorkshire, they lie just a short drive from the market town of Brigg, or just a few miles from the Humber Bridge, where you can park up and enjoy a stroll across the bridge and refreshments in a local tea room. Hull can be reached in under 20 minutes and has a huge range of shops, pubs and restaurants, as well as the marina and The Deep, Hull’s award-winning aquarium. The Yorkshire Wolds is approximately 30 minutes’ away with its lovely views, rolling countryside and country pubs. Famous for its cathedral, castle and Bailgate shopping area, the city of Lincoln is less than an hour away. There are excellent cycle routes and walks from the door with the village of Elsham a pleasant walk away. The shop is 2 miles from Village Farm Barns near Brigg, with the pub and restaurant 2½ miles from Village Farm Barns. These properties can be booked together to sleep up to 6 people. The Crew Yard is all on the ground floor. Living area: With gas wood burner, 42 Freeview TV, DVD player and iPod dock. Bedroom 1: With king-size bed, Freeview TV, bath and en-suite wet room with shower, toilet and heated towel rail. Bedroom 2: With zip and link twin beds (can be super king-size on request), Freeview TV and en-suite wet room with shower, toilet and heated towel rail. Gas underfloor central heating, gas, electricity, bed linen, towels and Wi-Fi included. Welcome pack. External utility room with washing machine and tumble dryer (shared with other property on-site). Large enclosed garden with sitting-out area, garden furniture and barbecue. Tennis court (shared with other property on-site). Bike store. Private parking for 4 cars. No smoking. Please note: No children under 7 years old. There is an unfenced pond in the grounds, 220 yards away. Holidays at The Crew Yard, Village Farm Barns run from Friday to Friday. For a better idea of where Village Farm Barns - The Crew Yard is, you can see Village Farm Barns - The Crew Yard on the map below. Do you want to holiday near Village Farm Barns - The Crew Yard (UK11123), you can see other cottages within 25 miles of Village Farm Barns - The Crew Yard; have a look to find your perfect holiday location.